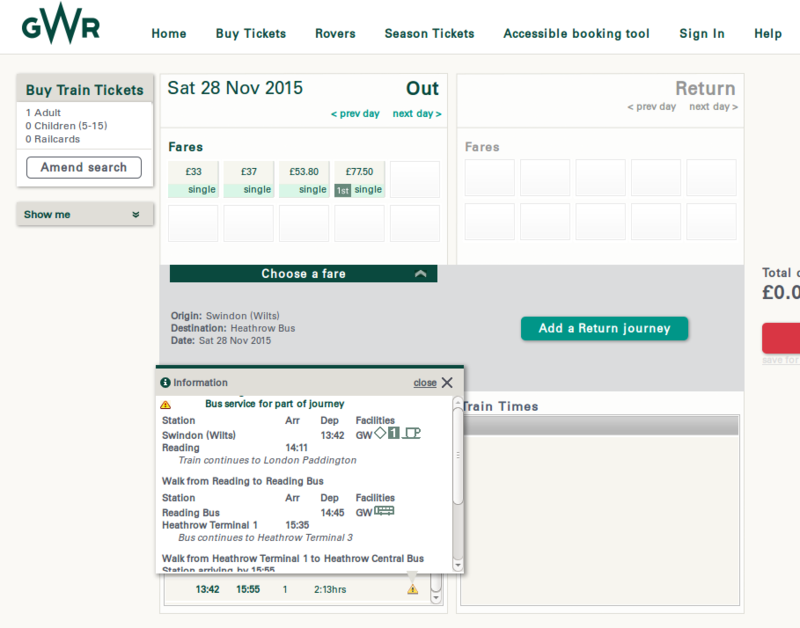 Is it possible to buy a combined train ticket to Heathrow that takes the railair? I would like to buy a train ticket from Swindon to Heathrow, changing at Reading to take the railair bus. However the online train ticket services, such as GWR do not offer me these tickets suggesting that I go via London or Hayes and Harlington. I can buy the train ticket and the railair ticket separately from different websites but I am worried that there is a reason I am not being sold the combined tickets. Is it in fact possible to buy such a combined ticket? Not the answer you're looking for? Browse other questions tagged uk trains tickets airport-transfer lhr or ask your own question. Is it possible to change a Trenitalia unused regional ticket after the time of departure of the train? Is there a website that shows the cheapest train ticket on each day, given the input of departure and arrival city in Europe?